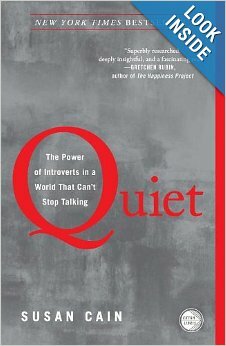 Book Review – Quiet: The Power of Introverts in a World that Can’t Stop Talking | OFF KLTR! You can hear the author, Susan Cain, pretty much sum up the book in her TedTalk. I found this book quite validating for me – an introvert who is not shy. I can be a loud mouth, BUT I am exhausted by being around large groups of people. I usually have fun at parties, but I leave them depleted. I require quiet time alone to re-charge. In college, the third floor of the library was like heaven on earth! That silent floor of the library was my peace and quiet for four years. And when I worked in the business world, I hated spending my days in a cubicle. No privacy. Constant interruption. I only dreamed of my own office – with a door – where I actually would be able to concentrate. But the real learning happened for me when I thought about Keira in relation to this book. She is certainly an introvert, but not a loud-mouthed introvert like me. So no wonder why school was so overwhelming for her! She was trapped in a room (albeit a room with lovely lazure pink walls and beautiful wooden toys) with sixteen other children. The room’s vibration was high. The hum was downright loud and the room was filled with constant motion. If I’d been in that environment (an extrovert’s dream come true!) for four and a half hours each day, I would have come home hitting, kicking, and screaming, too! And I’m a loud mouth! Introverts need time and space to recharge. But those necessities are not available to them at school. Of course my poor baby melted down everyday (from the moment she entered the car at pick-up to the moment she went to bed). OMG. Thinking back…it really was hell – for all of us. Just thinking about it brings back all of the feelings of stress and overwhelm and despair. So certainly the environment caused Keira stress, but equally important, the class did not bring out her quiet, breath-takingly beautiful gifts. And the class missed out on something wonderful. I think that Susan Cain is right, we as a society need to change – to change how we structure work and school so that the environments work for both introverts and extraverts. And this change is not just to meet the needs of those silly introverts. We as a society have much to gain from these quiet people…if we could all just stop talking!! « Waging War on Disease. Huh?! I so feel this! While I certainly have many extrovert qualities (and often score about 50/50 intro/extro on scales (though I suspect it would have shifted by this point in my life and it’s been years since taking them), I’m also a loud-mouthed, sociable introvert. I can hang at parties and put on a good, vibrant social vibe but I do find it REALLY draining and do best when it’s in short bursts. When I overdo it I get quite depleted, end up kind of going into overdrive and often get sick. My big boy is like this too. School is challenging for this reason because he does have to be “on” so much. He longs for the quiet time at home, but gets stuck into the craziness and has trouble getting there sometimes. Great topic. When we starting that book club?